Durga Puja spells trouble in my life. A lot of people asks just too many questions about my work, hair fall or for the lack of any other topic – when I plan to get married! Outside my home, it is chaotic with a hundred thousand people vocally exhibiting their enthusiasm, abusively bargaining or busy scolding people around. I still do not understand why everyone around gets happy! Is it buying new clothes or seeing ten more pandals? New clothes do not make me happy. Going out with a close friend to buy one, does. The smile on the face of the loved ones whom I gift clothes, is one of the happiest feelings. The real happiness is with a close group of friends. Even if we run out of topics of discussion, sharing silence together seems blissful. Even if they scold and not let you work, you smile and give in. Arjyak is amusing. This school pass out who could not manage to write an email subject line last year is now the co-owner of Kolkata Bloggers and manages it’s communications. He is one of the very few who know what makes me happy or when I am tense. 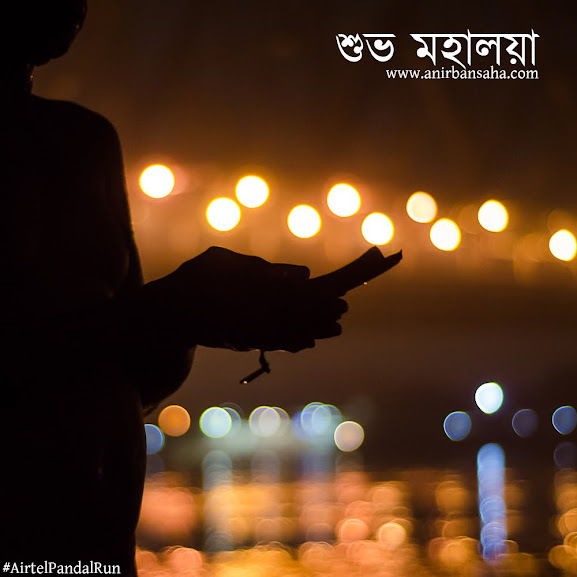 The curious Arjyak was disappointed because he did not much find the aunties doing sindur khela interesting. The numerous photographers ganging around any pretty married lady amused him. What amused him even more, are the three red vermilion dots on his face. The smile on his selfie made me laugh a lot. Talking about friends, Arjyak isn’t the only one. I am blessed with a crazy set of friends. While Rrivu, Esha and Amartya accompanied me for Kola Bou snan, Asmita, Rishav, Rimbik and the other lot abandoned their Ashtami plans to do Dhunuchi Dance. Upasana, Parth, Anish randomly meeting up! Anurag kept asking me to go to Belur Math and the Puja ended with walking under the moonlit sky of Bishnupur at near midnight. 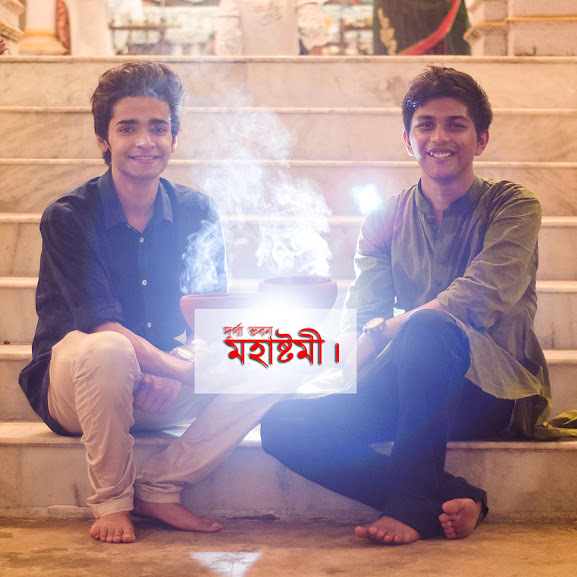 I never knew this puja would turn out to be so special. I would not make this post an entirely personal one. 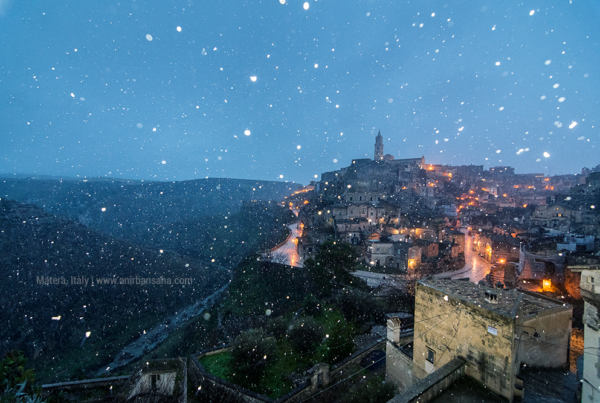 I’ll be the dedicated photo-blogger and try to mix personal experiences with information. Vivel Pujo Love & meeting Dev. Vivel is a premium luxury brand of ITC. This Durga Puja, they had taken the less privileged children out on Pandal hopping with Bengali film actor Dev. We had organised a small bloggers meet with the brand ambassador and the marketing head of Vivel. It was a pleasure meeting Dev in person. Vivel and Dev plan to take this initiative forward to organise even bigger events the next year. 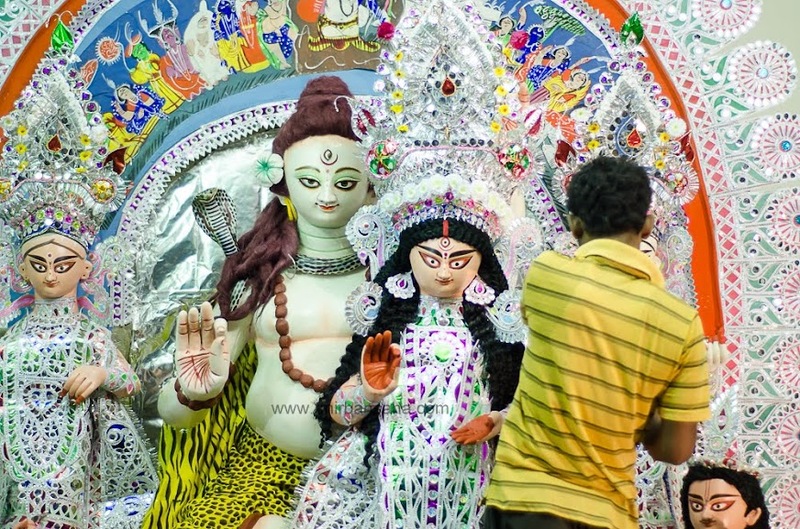 Bholanath Dhaam Bonedi bari Pujo. 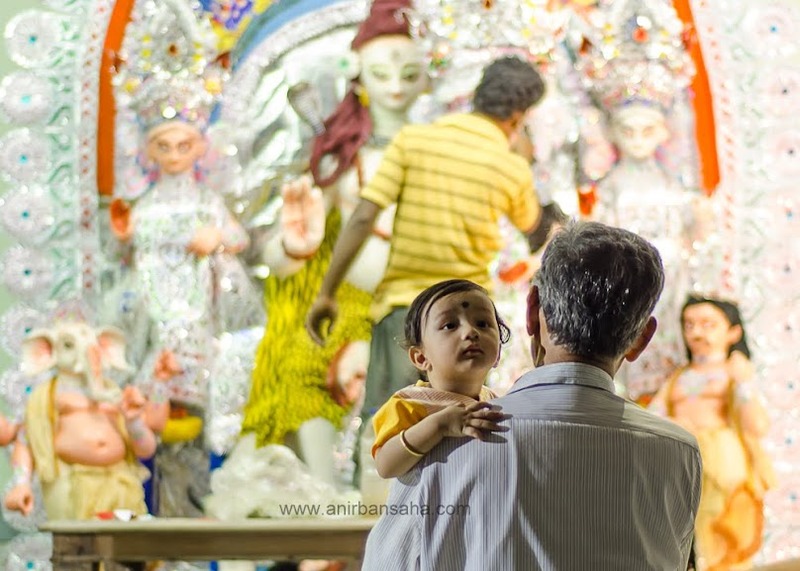 This is one of the few most respected traditional families who performs Durga Puja. Having started in 1905, this is unique in more ways than one. They are descendants of the legendary Chand Sadagar and are followers of God Shiv. 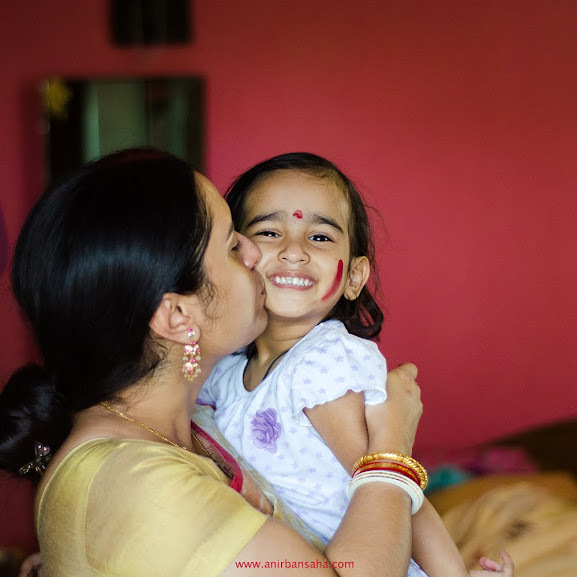 Even during Durga Puja, the larger idol is of Shiv and Durga is worshipped as a eight year old girl child. The entire worship is done following Vaishnav non-violent tradition and no sacrifices are made. Even Mahishashur is not shown as being killed. Due to my weak health, I could not photograph most of their events. Bholanath Dhaam is equally famous for its Diwali celebrations where they light huge sky lanterns. Thank you Rangan Datta da for getting me in touch with the owners of this house. 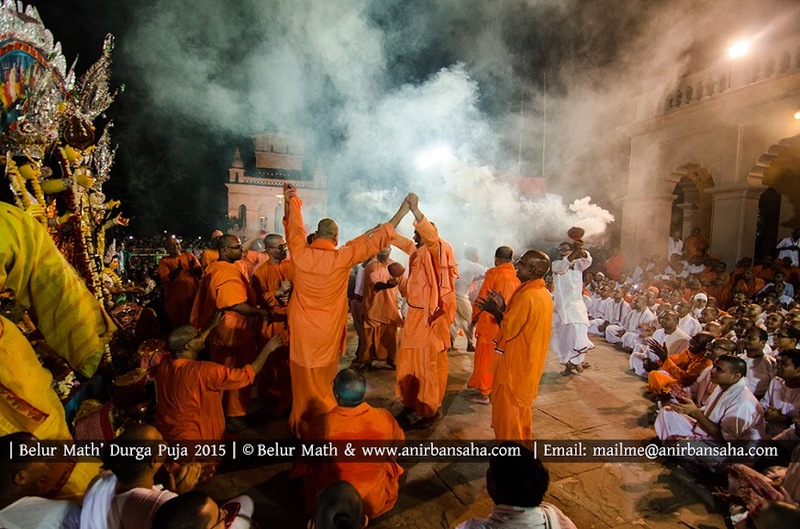 You can read more about Bholanath Dhaam’s Fanush celebrations here. 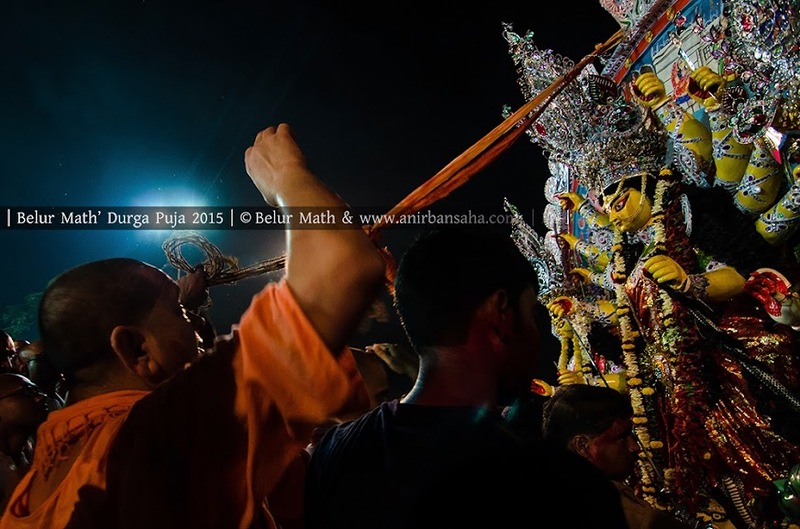 Mahalaya: Tarpan and Karna’s story. 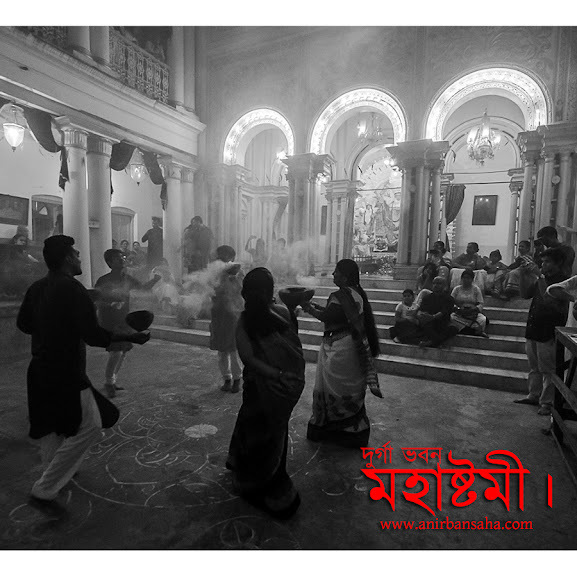 Mahalaya marks the end of Pitru Paksha and the start of Devi Paksha. We all know that by now. 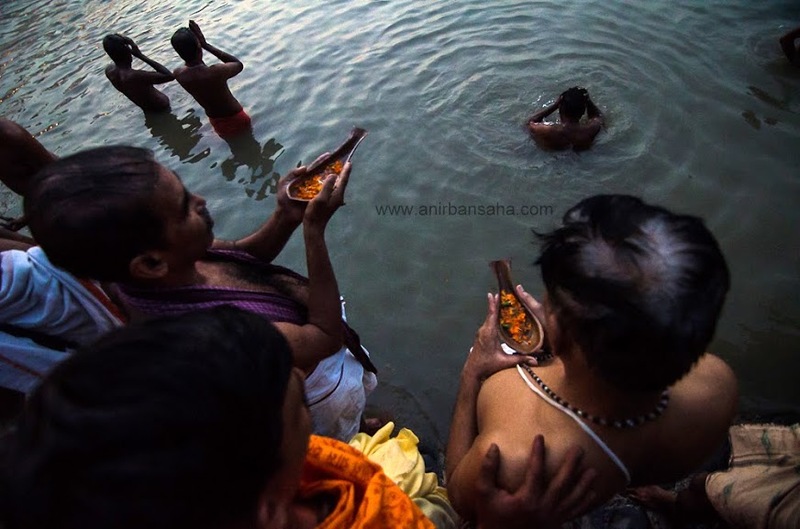 But what exactly is Pitru Paksha? When Karna (one of Mahabharata’s heroes) died and went to heaven, he was offered gold and jewels as his meals. He asked Indra (the king of heaven) why he was not offered proper food. Indra told him that he never offered food to his ancestors. Later Indra allowed Karna to come back to earth for fifteen days to offer food for his ancestors. These fifteen days are known as Pitru Paksha. 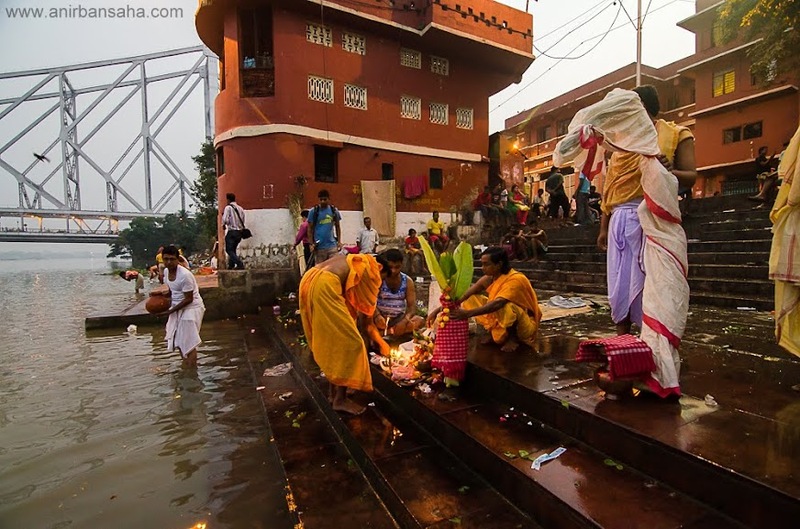 It is considered to be very auspicious for paying homage to the departed souls. 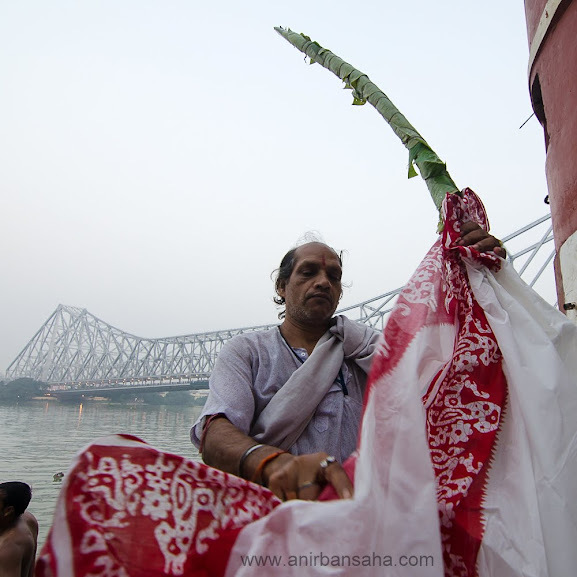 The morning of Mahalaya starts with offerings to the forefather for the attainment of peace of their souls. In return they bless their descendants who performed the rituals for prosperity and welfare of their lineage. I should thank Souranil for coercing me to go and photograph this time. Thank you Koustav, Aikantik, Swarnava for being there! This is one ritual which does not have a proper documentation at all. But this happens. Every Saptami during the sun rise. Kola Bou is popular as God Ganesh’s wife. This thread of the story has it’s own myths. The other story says, the banana tree is intended to serve as a symbolic summary of the nine types (“Nava Patrika”) of leaves that signify Goddess Durga’s various forms. They also represent fertility in the land of Bengal. This happens in almost all Ghats of Ganga. 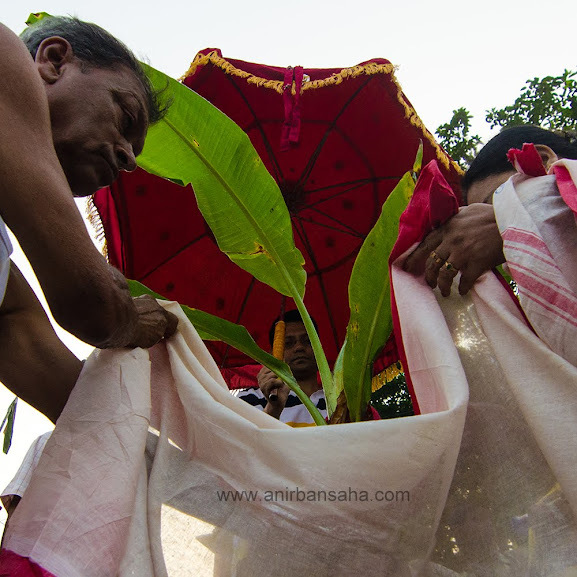 The young banana tree is cut and brought to the river, washed, draped in a white saree with red border, worshipped and taken to the Durga Puja and placed to the right hand side of Ganesh. Thank you Rrivu, Esha, Amartya for joining in. Thank you Srivatsan for coming to Kolkata and being a part of the celebrations. Dhunuchi Dance at Durga Bhavan. Never before did I shoot Dhunuchi dance. Not that anyone could give me concrete information as to where I could have shot. Irritated by everything around, I decided to host a Dhunuchi dancing session myself at Nivedita’s place. Nivedita’s home (Durga Bhavan) is slightly more than one hundred and fifty years of age. Their celebrations there are legendary and more than anything else, the interiors of the courtyard looks good and I wanted to shoot there. Dhunuchi naach by my friends, at Durga Bhavan (Saha bari). 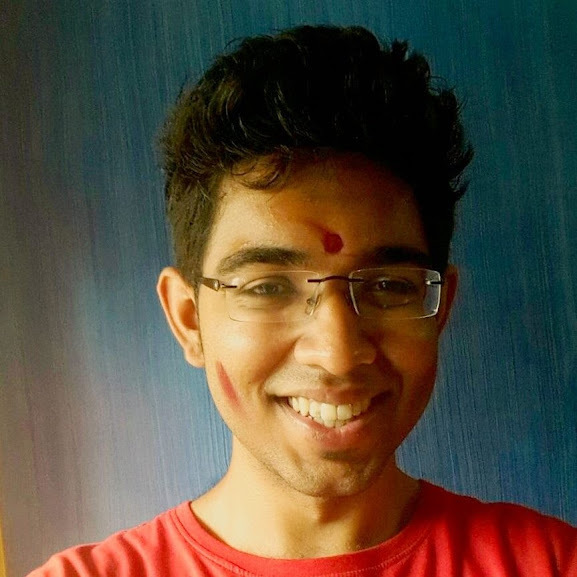 Within 5 hours of having thought of organising it – we saw Asmita, Rrivu, Rimo, Swarnava, Srijoy, Gammy, Rimbik, Anumita, Kunal, Sohini, Rubai and his four friends, Amartya, Nivedita, Aritra and their cousins – all join in! We managed to bring all ingredients. This was the first time I even saw a proper Dhunuchi dance and towards the end I feel like a pro! All the dancers there were first timers! 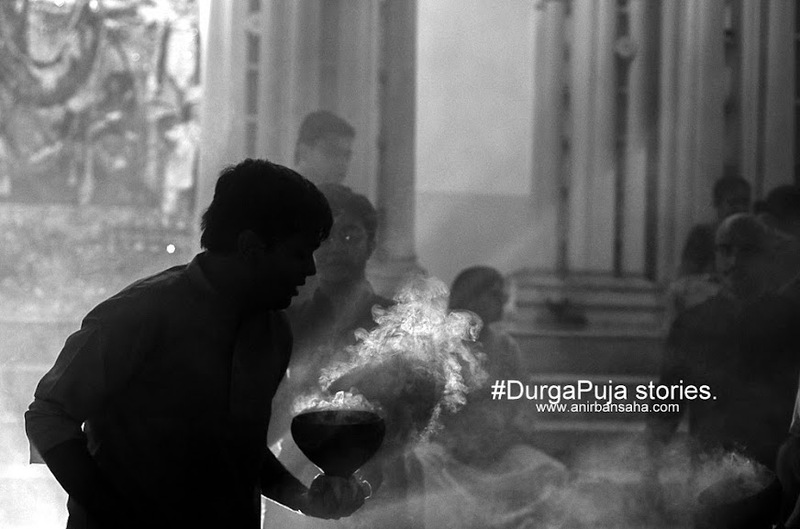 Such is the magic of Durga Puja! 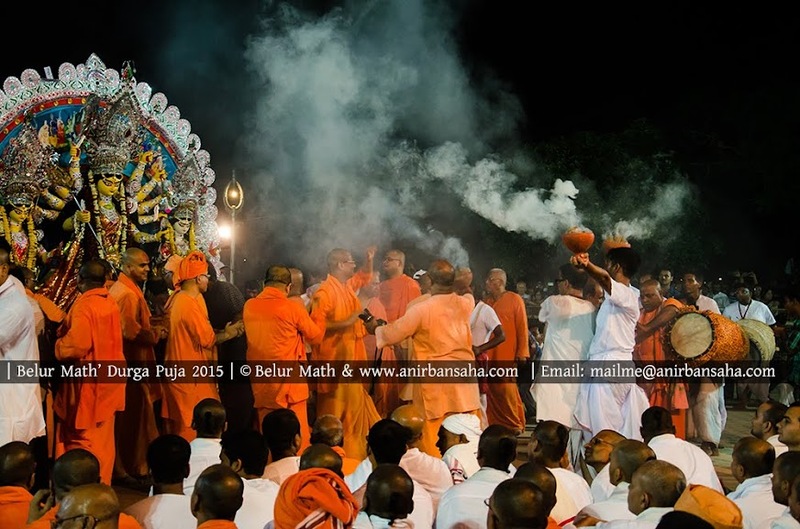 Visarjan at Belur Math, Ramkrishna Mission headquarters. Belur Math is the global headquarters of Ramkrishna Mission. This is a pilgrimage which is known for its discipline and dedication to humanity. Built on the principles of Sri Sri Ramkrishna Paramhansa Deb, Sarada Maa and Swami Vivekananda, this place is called the “Temple of Universal religion”. The Durga Puja is very special here and even the media has restrictions. Not everyone is allowed to photograph inside the temple complex or the rituals of Durga Puja. I feel blessed and privileged to be allowed to photograph Saptami afternoon and the visarjan (Idol immersion) in Belur Math. I should thank Anurag Banerjee for forcing me to go there. I never expected to be greeted with so much warmth and regards. On the Saptami day, the Maharaj scolded me for not having food (bhog) since morning. We had Bhog there and it was special. 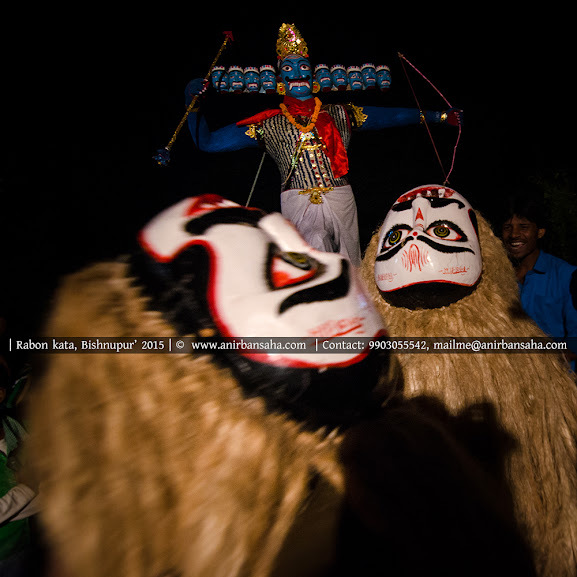 Rabon kata celebrations at Bishnupur. This happens during Dashami of every Durga Puja. 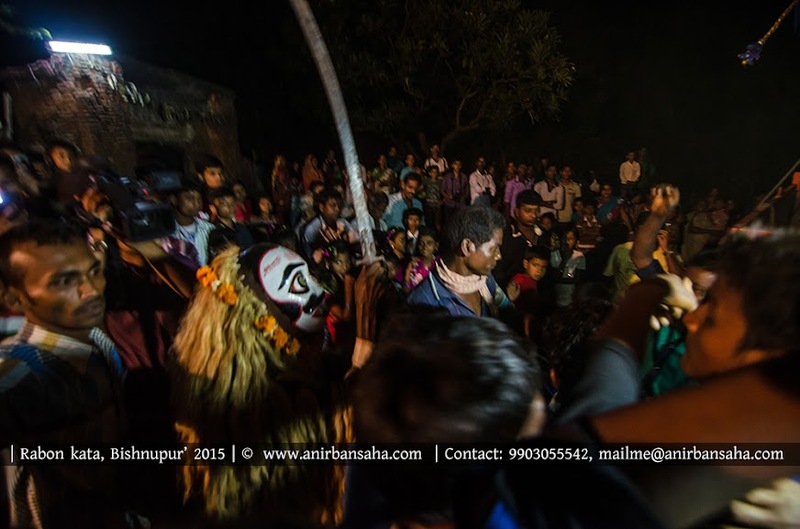 Quite aligning to the traditions of the north Indian Dussehra, in this six hundred years old tradition – the demon Ravana (Bengali: Rabon) is cut. 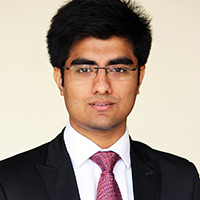 I was informed by Amartya, who is also a teacher of Rabindrabharati University, Department of Mass communication. The idol of the demon king is made. Four masked dancers representing different characters in Ramayana come dancing all along, with the sacred sword (which otherwise is kept in the nearby temple), gets up and cuts the throat of Ravana. The headless idol of Ravana is then scavenged by human beings. 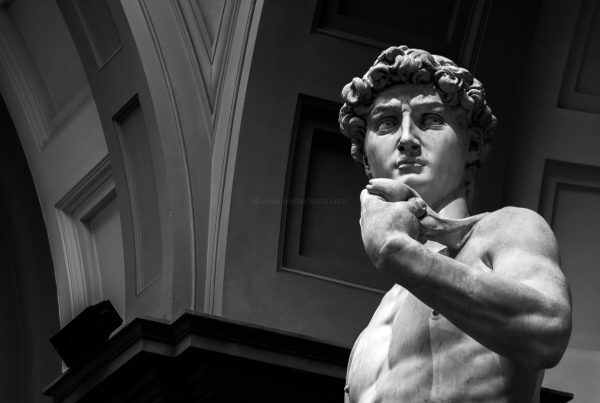 The clay of the idol is regarded sacred. 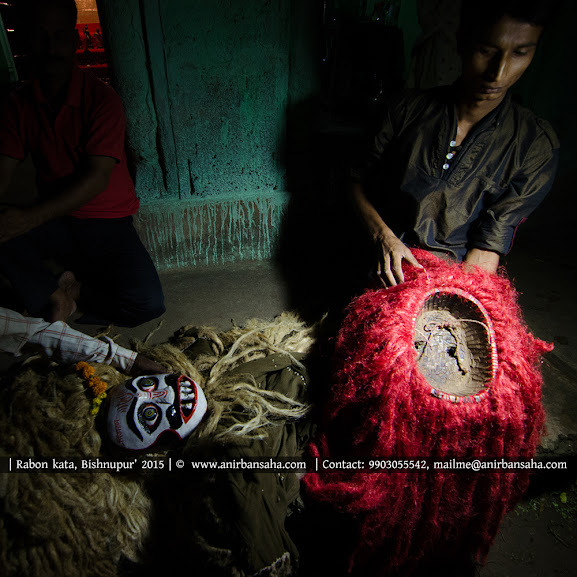 There are six masks and they are believed to be as old as the rituals. It is only this time of the year that they are put to use. I realise this post was really long but I hope you’ve enjoyed it. I thank Esha Chatterjee for the edit. Do not forget to leave a comment, ask any question and follow me on Twitter and Instagram to stay connected. Previous PostBhoot Chaturdoshi, what's that? Next PostDSLRs are passé, Mobile photography is the new cool. This is so lively, full of the Kolkata spirit. Loved the photographs. Each one telling its own story. Yup, sure…read the #100FireFlies, loved it!